CD Sale: Help us make space for some of our 2013 releases and clear the shelves of the old distribution titles. We have tons of CD's on sale for $5.98-$7.98. Pick up releases from Aghast View, Psyche, Massiv in Mensch, Headscan, SMG, Amish Rake Fight, Collide, Regenerator, Controlled Fusion, Christ Analogue, Diverje, Severe IIllusions, The Mercy Cage, Isis Signum, Kifoth, Echoing Green, November Process, Micronaut, Steril, Run Level Zero, Ionic Vision, Endif, Disharmony, Object, Cruciform Injection, Filament 38, Venetian Snares, ArtofFact, DSBP, Vendetta, Positron, Negative Gain, NoisePlus and many more. To visit the WTII Store click here. 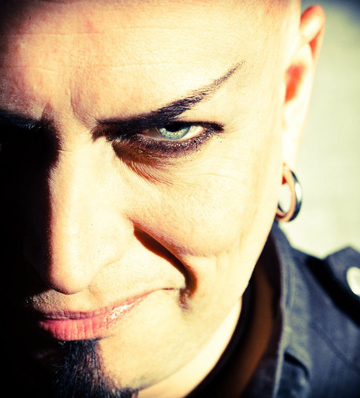 UK powerhouse, Deviant UK has signed a North American deal with Chicago based WTII Records, LLC. Since materializing in 2004, Deviant UK has released two albums and a remix EP and has established itself as a force to be reckoned with in the dark alternative scene. 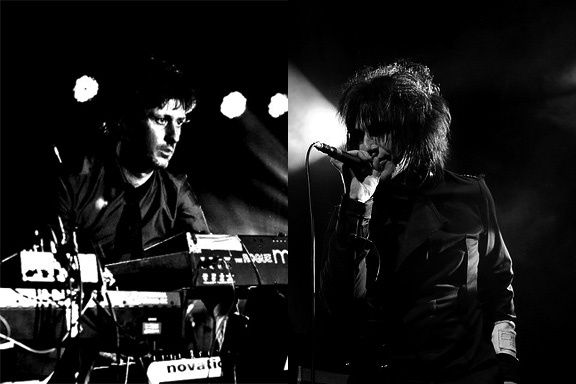 Deviant UK is no stranger the North American market as they have complete two national tours; the first tour was in 2009 in support of Project Pitchfork and most recently in the fall of 2012 as part of the Theory of Evolution Tour. Deviant UK will release two albums in North America in 2013. They will make their WTII debut with the re-release of their critically acclaimed second album, "Very.Bad.Things" on April 23rd followed by a new studio album in the summer. The WTII version of "Very.Bad.Things" will include 3 previously unreleased remixes. SMP has been hard at work on their new album, scheduled to be released in the spring of 2013. The WTII Free Spring sampler featured the song Cryonica, which was the first preview of the album and now they offer another glimpse with the release of the I Don't Mind video. 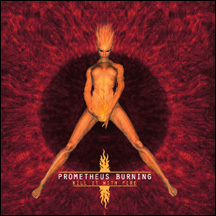 We are now taking Pre-orders for the upcoming Prometheus Burning release Kill it with Fire. Aimed at annihilating the dance floor, Kill it with Fire, features 9 new cuts plus remixes from Portion Control and I, Parasite. Order your copy here. 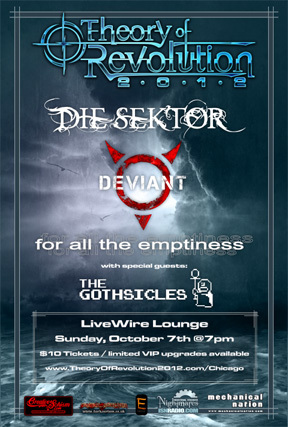 Check out The Gothsicles on the the Theory of Evolution tour with Deviant UK, Die Sektor and For All the Emptiness. 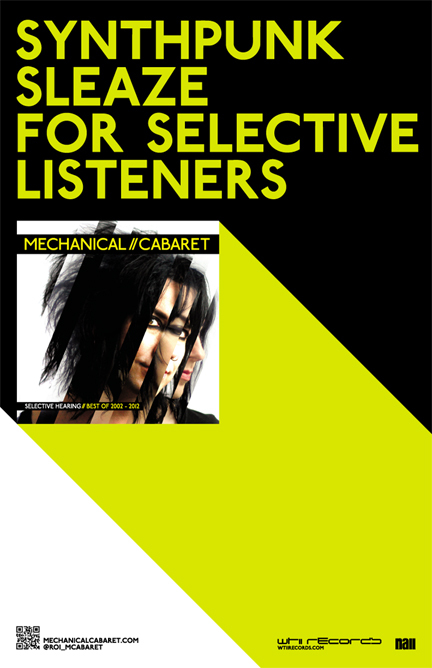 London's electro-punk duo, Mechanical Cabaret have signed a North American deal with Chicago based WTII Records, LLC. Formed in 1999, Roi Robertson and Steve Bellamy combine a heady mix of industrial strength electro, memorable melodies, slamming beats, acidic synths, sci-fi soundscapes and throbbing bass, along with Roi's lyrical observations of the darker side to life - all delivered with a deadpan dose of sardonic punk attitude and British black humor. We are proud to announce that we have signed Pittsburgh's Prometheus Burning. Their WTII debut, Kill it with Fire, is scheduled for release in November. 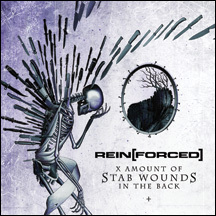 We are just about a month away from the long awaited release of X Amount of Stab Wounds in the Back from Rein[Forced]. You can now pre-order your copy in the WTII Store. Displaying 71 to 80 of 271 available news items.